Shoreham Football Club today named Sammy Donnelly as their new boss. Donnelly, who has been in charge of Mussels' under-21 side for the past six months, will succeed departing manager Bryan O'Toole after he resigned from his role as Shoreham boss on Monday. It is still not known what division Donnelly will lead the Shoreham into next season. 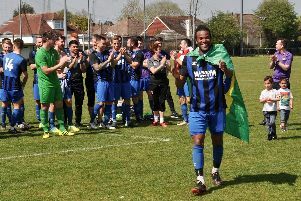 After finishing second in the Southern Combination League Premier Division under O'Toole this season, table-toppers Haywards Heath Town Football Club have been charged and await punishment from the SCFL for fielding a player while under a 'sine die' suspension. Leaving Mussels with a potential chance of promotion and the SCFL Premier Division title, should a points deduction be issued. Whether Mussels are a Ryman League or SCFL outfit next term, Donnelly will be taking charge. Shoreham's new boss has a wealth of experience having managed at Worthing, Lancing, East Preston and at Middle Road previously. Mussels chairman Stuart Slaney sees Donelly as a perfect replacement for O'Toole. He told the club website: "After slimming down CVs and interviews with other candidates, it was a no-brainer. "Sammy has been at the club for the past six months managing the under-21's and helping Bryan with first-team duties on matchdays. "Sammy's got a wealth of experience, not only at SCFL level, but Ryman League level aswell. His contacts throughout the game are second to none, so we are confident that we've made the right choice."